Doing the same thing over again isn’t such a bad thing after all. 22 Jump Street is the exact same film 21 Jump Street was, but with one key difference: it’s self-awareness. While 21 Jump Street was just aimlessly spastic and immature, 22 Jump Street uses that same spasm and immaturity and chooses to make fun of itself for the sake of the audience. 22 Jump Street isn’t laughing with the audience: it’s laughing at the audience laughing at itself, and it is infinitely funnier because of that. 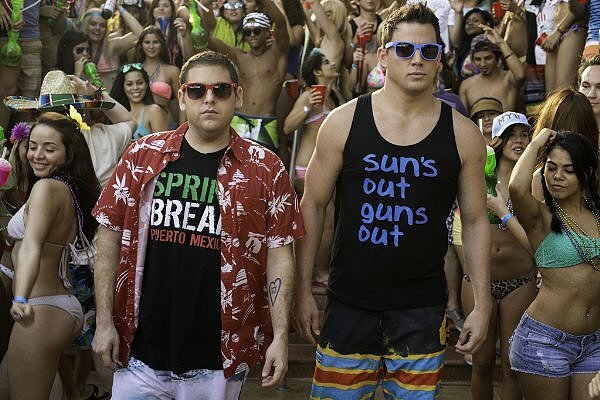 22 Jump Street takes place after Captain Dickson (Ice Cube) tells Schmidt (Jonah Hill) and Jenko (Channing Tatum) that they’re about to go undercover at college. After a student died at the hands of a lethal new drug called WyFy, their job once again is to infiltrate the dealers, find the supplier and bring them to justice. Resuming their cover identities as brothers, they slowly try to adapt to college as they continue to search for the supplier who is providing for the whole operation. “Waitaminute,” you might ask. “Isn’t this what happened in the first movie?” Yes, but like I said, the movie is more aware of itself than by just simply repeating what it did the first time around. This time, Tatum is the guy who is getting accepted and friendly with everyone around campus, while Hill is more or less left to go and sip wine with the art students. Like I said, the film is on repeat from the plot with the first movie — similar characters, similar jokes, similar order of events. For Pete’s sake, even the run time is the same, with both films clocking in at about 1 hour and 50 minutes. But like I always say, the repeat isn’t what matters. What matters is how they handle that repeat, whether it genuinely is a funnier, more refreshing take of the original rather than just a rehash. And let me tell you, even though it has Tatum and Hill in it, neither of which I’ve ever found particularly funny, I’ve never laughed harder. These two guys are hilarious in the movie. Tatum is good as Jenko, a smug older jock who loves to drink beer, play football and show off his physique through physical feats that make me ashamed of my own body. Hill was even better. Whether he was getting into character as a Mexican mobster, trying to impress some girl or desperately trying to figure out how to drive a ferrari, he was clumsy, expressive and hilarious all at once, expertly becoming the likeable underdog needed for a film like this. Great as Hill and Tatum are though, they are not the highlights of the film. The real stars of this movie are directors Phil Lord and Christopher Miller, both of whom recently directed The Lego Movie together. Lord and Miller, who also helmed the first film, seem to have a much more fleshed out idea of what they wanted Jump Street to be this time around. The first movie was just a loud, blatant action-comedy, shooting in every which way and direction with no clear aim or focus. Here, the aim couldn’t be more clear. From hearing bits of scathing dialogue — “We’re going to do the same thing all over again” from the captain — to the hilarious end credits spoofing every movie that had laughs and a gun, we can tell their goal with this was to slam the idea of sequels, to make fun of the problems that exist in them, then immerse themselves in that zone of making fun of themselves for the sake of our enjoyment. I’ve had a complete blast with this movie. In every moment of the film I was either smiling, laughing my head off, or catching my breath, preparing myself for the many laughs to follow. I kept tossing around in my head whether I liked this movie or loved it, whether it was a truly definitive piece of comedy or just something fun to laugh at. I’ve concluded that it is both. 22 Jump Street is a big ball of action-packed comedic fun, a great sequel that has funny jokes, charismatic characters and wonderful self-irreverence. It’s an improvement upon the original in almost every way and will no doubt be a big problem to the studios once they realize they’re going to have to make a second sequel.